You are at :Home»News»3D Printing Industry»The Spaghetti Detective – Is It A Monster? You own a 3D printer and you have Octopi setup with a camera in order to monitor your prints. You leave a print whilst you go out to work and check on it periodically just in case something goes wrong. When it does go wrong, all you can do is cancel at the point you notice meaning wasted filament…This is where The Spaghetti Detective comes into play! Capture> Webcam captures real time 3D print images and sends them to The Spaghetti Detective. Gauge> The Spaghetti Detective gauges the likelihood of a failure by analyzing the images. Alert> If a possible failure is detected, it will pause the printer, turn off the heaters, and alert you via email or text. Save> You cancel the print from your phone if failure is confirmed. Save time, £, and your worries. Setup is really easy for the Spaghetti Detective! Once you have installed the plugin via Octoprint, it comes up with a setup wizard. Just go through these and you’re done! I think this is the most common question when it comes to Beta testing (For example in the Pathio Beta software article). The Spaghetti Detective is an open source project. You can always grab the code and run the server yourself. If you wanted to skip the hassle of setting up the server, you can use The Spaghetti Detective cloud, which will be free to all beta testers during beta testing. Once the beta has finished, you can choose to stay as a free account with limited service, or upgrade to a paid account if you want unrestricted access and features. Check out how the future pricing will look like. Upon first use for me, setup was a breeze! 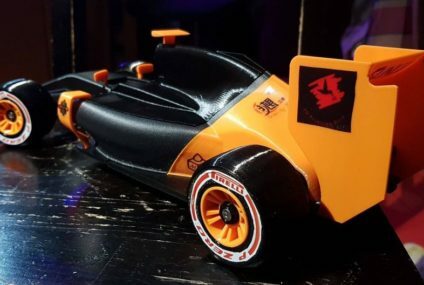 I have a CR10S with a mirrored bed and I was also using black PLA. With the contrast of the black frame that is reflected in the mirror whilst printing, I found that some detection was missed as it kind of camouflages together. I have yet to play around with the settings to perhaps increase its detection rate, but also to use different coloured filament. I was also doing a small print, and having Octolapse enabled, this moved the hot end to the left so it was able to get a good view of the print in progress. This kind of add in could be really beneficial for big prints. The Spaghetti Detective is a plugin for Octoprint. 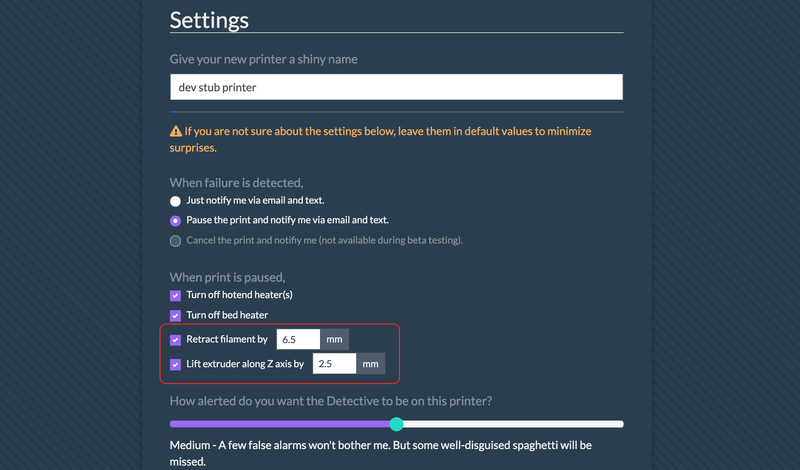 The plugin uses your camera connected to your Octoprint and analyzes snapshot to detect potential print fails. It will then send you an email and/or text message based on the users’ preference. Once the install is completed, there is a quick website registration, and that’s it. I ran a test print that I intentionally designed to fail. It picked up the “spaghetti” instantly. I received a text message letting me know of a potential failure and paused the printing process. Once I clicked on the link, I could see the picture and the “Spaghetti ” outlined with a green box. So far, I would say that this is a success. Further testing will be needed, but this shows great promise and may be the MUST HAVE plugin for Octoprint. Check out their YouTube video below! Also, you can view more info on The Spaghetti Detective website! More will be added over time as we use this more so keep checking back for further updates. In the meantime, why not go and check out the Stinger 2 Preview! This is an email received as part of the Beta. After extensive testing (big thank you to everyone who helped), we are now confident in the resume/pause scripts in version 0.5.1. Therefore we have re-enabled the automatic pause-on-failure function. Along with that we brought you the ability to set retraction and z-lift on pause. A picture is worth a thousand words. 1. 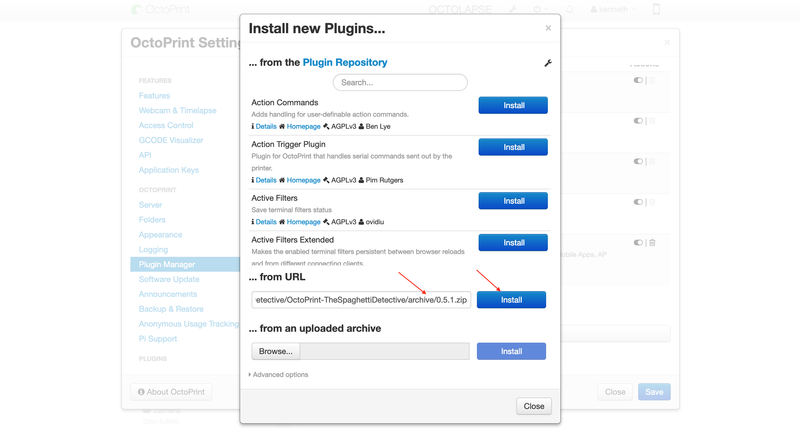 Open OctoPrint settings page -> Plugin Manager -> “Get More…” button. 2. Copy and paste https://github.com/TheSpaghettiDetective/OctoPrint-TheSpaghettiDetective/archive/0.5.1.zip into “from URL” box. Then click “Install”.